Kate and Chelsie: Hyatt Regency London - The Churchill, GREAT GATSBY NIGHTS IN THE MONTAGU EVERY THURSDAY IN MAY! Hyatt Regency London - The Churchill, GREAT GATSBY NIGHTS IN THE MONTAGU EVERY THURSDAY IN MAY! To coincide with the release of Baz Luhrmann’s long awaited Great Gatsby movie, The Montagu will be celebrating the roaring twenties, every Thursday evening throughout May. Reveling in this decadent era, guests will enjoy a 1920’s inspired three course set-menu, including a coupe of champagne on arrival and live music with the get-up-and-dance sounds from the Hot Dog Corn Dogs, the Hotel’s resident band. Guest are encouraged to dress for a Great Gatsby party, as they will have the chance to win a three-night weekend stay for two people at the Grand Hyatt New York. 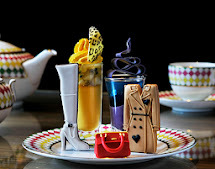 Each evening, one of the guest’s will be nominated as ’the best dressed’ and at the end of May, Michael Gray, General Manager of Hyatt Regency London – The Churchill will choose a final winner. The winner of each evening will also receive two complimentary tickets to a showing of The Great Gatsby. The 1920’s set menu will include well-loved American themed dishes. Starters such as Manhattan Clam Chowder and Classic Waldorf Salad will feature, whilst the mains will include a New York Steak Diane with fries on the side. For those with a sweet tooth, guests will enjoy such desserts as White Chocolate Cheese Cake with Blueberry compote and Pecan Pie with whipped cream. Guests will enjoy the vibrant tunes of the Hot Dog Corn Dogs! Including their charismatic singer and guitarist Laurence Corns accompanied by "nimble fingered" pianist Dan Teper. They combine foot-tapping jazz with a charming joie-de-vivre and down-to-earth grooviness. For an alternative night out and a jazzed up May, this roaring twenties evening cannot be missed. The Montagu Great Gatsby Nights will be held on 2nd, 9th, 16th, 23rd and 30th May between 6:30pm and 10:45pm and is available at £35 per person for the three course set menu and a glass of champagne.